As part of the Philadelphia Water Department’s Green Stormwater Infrastructure Initiative, North 13th Street is being reconfigured between Girard and Cecil B Moore with, among other things, a parking protected bike lane. The current 22 foot wide vehicle lane encourages unsafe speeds, and as a cycling arterial among people who commute by bicycle in North Philadelphia, including Temple students and employees coming up from Center City and South Philly, it has made for a dangerous combination. See the project’s fliers here. The Yorktown Green and Complete Streets Project on 13th Street is intended to have a traffic calming affect and increase safety for all users, and will be a great link in the 13th Street bicycle network. Additionally, the section of North 13th Street will also be getting stormwater planters to manage street and sidewalk runoff by providing storage, infiltration, and controlled overflow. 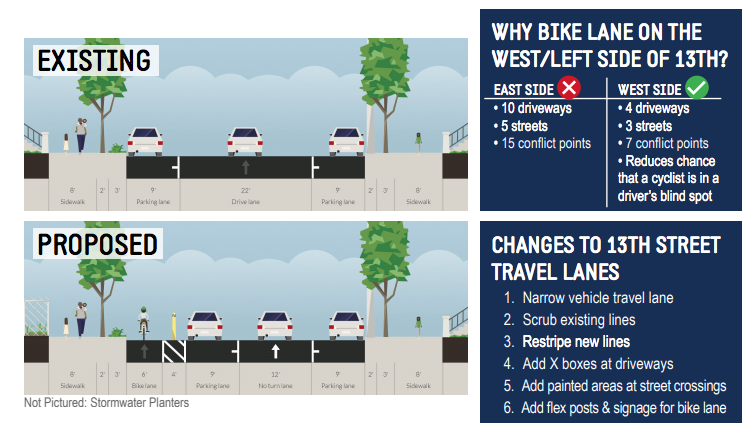 The new parking protected bike lane will be a great addition to the 13th Street Neighborhood Bikeway, and will increase traffic safety in the area. They need to repair the paving in the new bike lane. Not just leave it in fair to poor shape like the JFK or West Chestnut street bike lanes. The cars have a smooth path why not us! the bike lane designation/lines need to be repainted (upon entering and inside) under the Convention Center on 13th. It doesn’t seem to be clear to a lot of drivers.